The mountains that embrace the Cassarate and Vedeggio valleys (Valli di Lugano), with their sumptuous heights, suggest numerous enthralling walking trails amidst nature, which allow hikers to discover a rich cultural landscape and to enjoy an unbeatable view over Lake Ceresio, the Alps and the Pianura Padana (North Italy). This interesting excursion consists of a three-day walk along a fascinating itinerary that begins in Brè, above Lugano, and ends in Tesserete, in the ancient parish of Capriasca. Hikers may leave behind the city?s hustle and bustle and retreat in most quiet surroundings under a wide open sky. The 44.4-km-long itinerary tackles height differences feasible for every hiker in about 21 hours walking. Public transportation (TPL - ARL - Postcar) from and to the city and the main station of Lugano are available in both departure and arrival points. Lugano Trekking also suggests alternative hikes which last one or two days and which end in Val Colla, in Upper Capriasca (at about 1,000 meters above sea level), and in Upper Vedeggio. 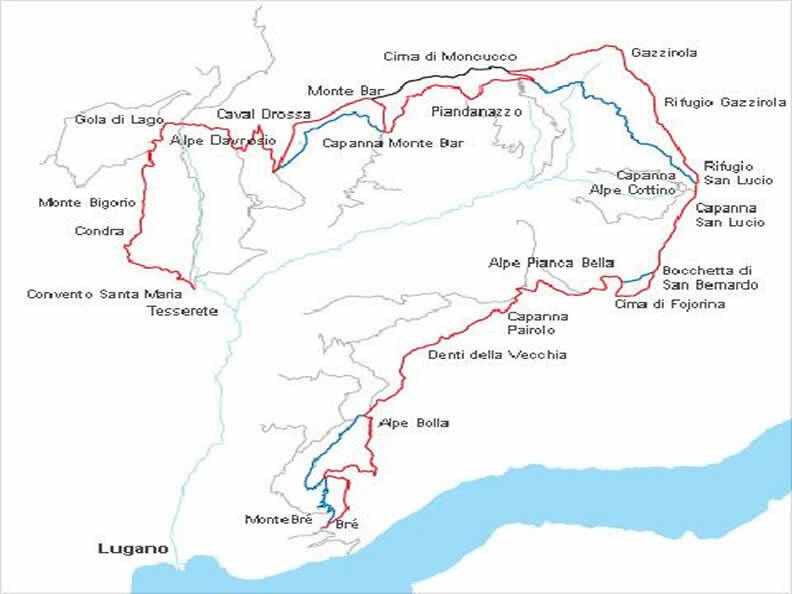 During the journey, which for the first two days mainly follows paths in border areas to Italy, hikers discover forests, meadows, pastures, mountain huts and shelters as well as farm houses offering meals, accommodation and the possibility to gain unique insight into the rural way of life. The mountains that crown the Cassarate and Vedeggio Valleys (the Valleys of Lugano), with their rolling hills, gives you the possibility of walking along enchanting paths, surrounded by nature, discovering a rich cultural landscape with a breathtaking view on Lake Ceresio, an extraordinary panorama on the Chain of the Alps and on the Pò Valley. The proposal of Lugano Trekking is an interesting experience that allows you to walk for three days, following a fascinating itinerary that begins in Brè town and ends in Tesserete, at the ancient Church of Capriasca. The hiker leaves behind the noise and lights of the City and takes refuge in silence and the immensity of the sky. 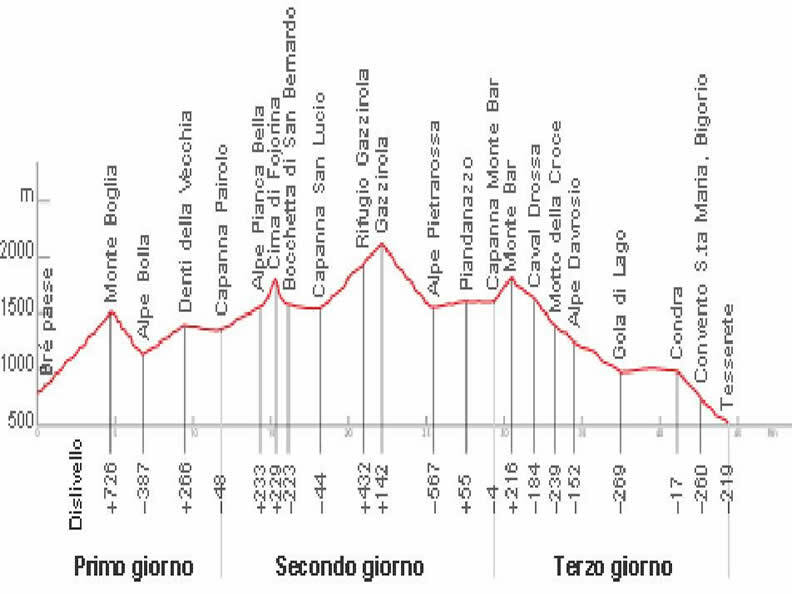 The itinerary, which winds its way for 44.4 km, with an altitude difference that everyone can cope with, requires 18 hours to cover. Public Transportation connects the point of departure and arrival to the City of Lugano and the Railroad Station. Lugano Trekking offers you the possibility of choosing among several different itineraries, lasting one or two days, and enables you to reach the area of Val Colla and Upper Capriasca, situated at about 1000 meters in altitude, as also the area of Upper Vedeggio. Along the itinerary, which during the first two days prevalently runs on the border with nearby Italy, there are woods, pasturelands, alpine meadows, as also, mountain huts and farm holiday structures, in which it is possible to find shelter, eat and sleep and experience the peasant way of life.